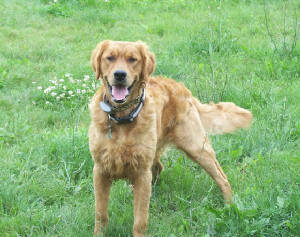 hearthsidekennels.com: One Golden Retriever Available! One of our families has opted for a Doodle puppy instead, which means one of Sadie's X Mick's puppies is still available. Puppies are AKC registered, from strong Midwestern lines, huge number of recognized field champions on both sides of the family. They will be vet-checked, they're home-raised, accustomed to being handled by children and adults, and used to cats, kittens, chickens and one obnoxious but very attractive Rooster! Click HERE for a pic of Mick's Dad "Thistlerock Red Rooster" If you scroll down past Rooster's picture, you'll see his family pedigree for several generations. Amazing! And click HERE for a look at the Mioak branch of the family.... Another great Midwestern Kennel with a history of gorgeous, smart, active and healthy dogs. Sadie's mother "Bianca Bomber" and "Cokie" are from Thistlerock Goldens, a lovely Minnesota ranch that breeds beautiful Golden Retrievers. Lynn and Tom Lane have a decades-long history of producing beautiful, strong and healthy pups. We brought Mick to upstate New York when we realized that many breeders were using the same studs to get dark-toned Goldens. And we brought Sadie in to help spread the genetic pool further. Price of puppies: $600, cash only please. Pups will be available for homes by May 3, 2012. And the Doodles are all over two pounds now! Their eyes are open and they're starting to walk on sturdy little legs. A-stinkin'-dorable! Pups are old enough to receive visitors now! Call 585-392-2763 to set up a time to visit us and meet the babies!